No, not the socks that went missing in the laundry. 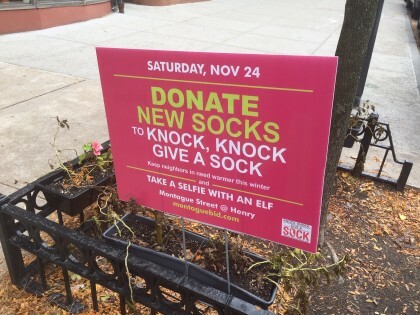 The Montague Street BID is celebrating Small Business Saturday this coming Saturday, November 24 from noon to 2:00 PM by collecting new socks, which are the item of clothing least donated to and most needed by the homeless. If you donate, you may take a selfie with an elf for free. Montague Street merchants “will offer special discounts, complimentary treats and holiday cheer, free gifts with purchase, and more.” There’s more information here.